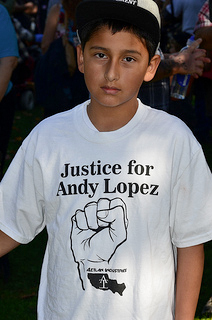 One version of an Andy Lopez t-shirt worn by Luis Diaz. Photo by Kurtis Alexander, The Chronicle. On Monday, February 17, 2014 (Presidents’ Day), uniformed security guards at Simon’s Santa Rosa Plaza impeded our first amendment rights to free and unfettered speech, as well as racially targeted and harassed Latino patrons. It all happened in the upstairs food court at the mall. Earlier in the afternoon, many Santa Rosa youth, known locally as Andy’s Youth, and others peacefully marched under the banner of Justice for Andy Lopez. The march proceeded peacefully and without incident through downtown Santa Rosa and concluded with a rally in front of the Santa Rosa Police Department where many of the young people poignantly spoke about the heart-wrenching loss of their friend and peer Andy. Following the march, a number of the participants, including Andy’s parents Sujey and Rodrigo Lopez, visited the food court at the Santa Rosa Plaza to eat. At approximately 5:30 pm, a contingent of Mall security guards approached the table at which Sujey, Rodrigo, their children and accompanying friends were eating. 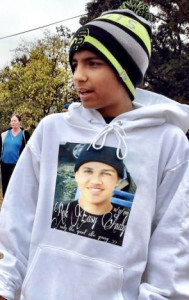 The security guards, who refused to provide their names, but who are on video, rudely and aggressively “instructed” the Lopez family and their friends to remove their t-shirts, which bore slogans such as “RIP Andy” and “Justice for Andy Lopez.” They were told that, if they refused to remove their shirts, they had to leave the Mall. The security guards specifically targeted only Latino patrons wearing Andy t-shirts. In fact, just one half hour earlier a white activist had walked in the front door of the Mall directly in front of the very same security guards without so much as a second-glance. Under any interpretation, the demand that Latino patrons, as a target group, remove their shirts was discriminatory and effectively treated a particular ethnic group as second-class citizens with limited free speech rights. Further, the actions by the security guards were a direct affront to the publics’ constitutionally protected First Amendment Rights – particularly the sacrosanct right of free speech – ironic as this occurred on Presidents’ Day. The actions of the security guards took a human toll. Andy’s parents Sujey and Rodrigo are still suffering emotional shock over the loss of their child. To be accosted in public in a rude and disrespectful manner further caused emotional stress and greatly exacerbated their tentative state-of-mind, which is still mourning the loss of their child as a result of seven bullet wounds from a Deputy’s gun. To add insult to injury, Sujey was wearing nothing but underwear under her t-shirt and held back tears as she was being instructed to strip. The Justice Coalition for Andy Lopez and Andy’s Youth have called for an Andy Free Speech Day at the Mall this coming Sunday February 23. To pick up a t-shirt and join others, come to Courthouse Square in downtown Santa Rosa at 1:30 pm.